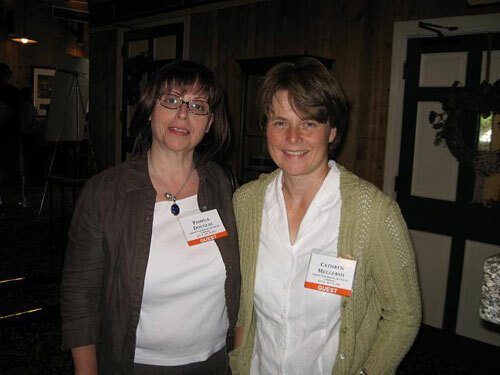 Pamela Douglas, J.D., President of Toby's Foundation, Inc.
Pamela Douglas, J.D., President of Toby's Foundation, Inc. attended the biennial 2007 Tufts' Canine and Feline Breeding and Genetics Conference with a Special Focus on Canine Epilepsy in Sturbridge, MA on September 13th and 14th. The important feature of this health conference for us was that it had a special forum on canine epilepsy. Since Toby's Foundation was set up to focus only on canine epilepsy and is dedicated to helping to stop this one disease, we felt that it was very important to attend this conference. Other conferences talk about genetics, DNA testing and even neurological disease but usually do not mention canine epilepsy. This conference brought together world renowned geneticists and researchers. 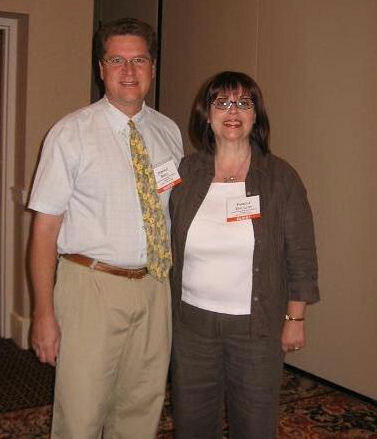 The Conference Director was Dr. Jerold S. Bell, Department of Clinical Sciences, Tufts Cummings School of Veterinary Medicine, North Grafton, MA. 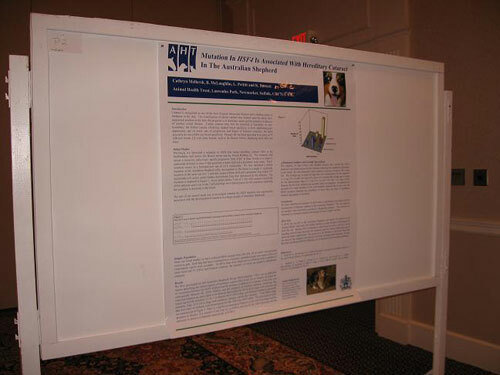 We are very grateful to Dr. Bell for putting together this outstanding conference with an emphasis on canine epilepsy. Discussion about canine epilepsy took place throughout the conference with an entire morning on the second day devoted exclusively to canine epilepsy with three lectures and a panel discussion. Dr. Anita Oberbauer, Department of Animal Science, University of California, Davis, CA; Dr. Edward (Ned) Patterson, University of Minnesota College of Veterinary Medicine, St. Paul, MN and Dr. Dennis O'Brien, College of Veterinary Medicine, University of Missouri, Columbia, MO spoke on canine epilepsy and participated in the panel discussion along with Dr. Cathryn Mellersh, Animal Health Trust, UK and others. Dr. Mellersh, who is well known by the Aussie community for her breakthrough work at the AHT on hereditary cataracts in Aussies, will soon join other European researchers in working on canine epilepsy. Dr. Noriko Tonomura, Tufts Cummings School of Veterinary Medicine, North Grafton, MA; Broad Institute of Harvard and MIT, Cambridge, MA spoke and said that the Broad Institute is interested in DNA samples from unrelated dogs. When I asked her about canine epilepsy in particular she said the Broad Institute is interested in receiving samples for canine epilepsy research. Dr. Ned Patterson shared details about the work that his lab has been doing to find the gene(s) responsible for canine epilepsy and on which breeds. Representing Toby's Foundation, I had the opportunity to speak with researchers about canine epilepsy in the Australian Shepherd breed and as a result of the conference we are in contact with researchers who are working on finding the gene(s) responsible for this disease. With the development of the SNP markers or "Gene chip" and an association approach being taken rather then just the familial approach, the timing and tools available have never been better. It also makes all of our samples (even with holes) far more viable and valuable then ever before. Several of the researchers with whom I spoke emphasized the importance of quality samples being submitted from affected dogs. Please urge any owner you know with an affected dog to submit blood samples on their dog. Toby's Foundation has updated our recommendation for submitting blood samples and will further update it and our research page on our website. Poster Announcing Cataract Breakthrough - Someday this can be Epilepsy! Thank you to those who have worked behind the scenes to help bring us to this point and to all the individuals, clubs and organizations who have given DNA samples on their dogs and/or have sent in funds to the various organizations for canine epilepsy research. Without your support we would not have the samples or money necessary for the research. Your ongoing support is needed until the day there is a screening test for canine epilepsy. Also at the conference, Dr. Cathryn Mellersh of the	Animal Health Trust, UK reported that she will be working with 5 other researchers from European countries on canine epilepsy research. One of the other researchers is Dr. Hannes Lohi in Helsinki, Finland. In a recent email to Toby's Foundation, Dr.Mellersh told us that they now know that the application will be funded, although at this stage they don't know how much they will receive. This European canine epilepsy research project offers great potential for finding the gene(s) responsible for canine epilepsy in various breeds including the Australian Shepherd. This European commitment to canine epilepsy is extremely encouraging. Toby's Foundation asked for Aussies to be one of the breeds worked on by this renowned research team. Dr. Mellersh said that the breeds that 'we ultimately choose to work on will be those with the best sample collections - breeds without sufficient samples from affected dogs will not be suitable.' She expressed to me that the Australian Shepherd should be one of the breeds worked on if the samples are there. 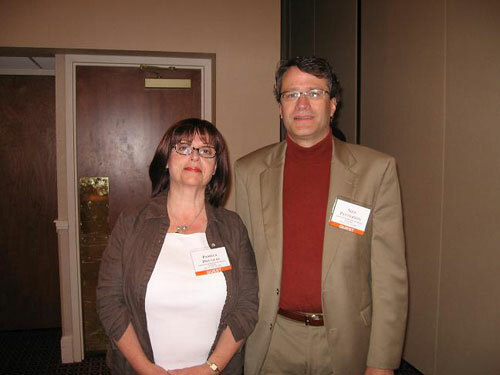 Dr. Dennis O'Brien at the same conference told me on September 14th that he expected Aussie samples to be sent to Dr. Hannes Lohi who has the SNP chips to run our Aussie DNA. Toby's Foundation is currently in the process of updating our recommendation for submitting blood samples.